Hello Loves 🙂 These Egg Bhurji Muffin Sandwiches are something I make all the time for breakfast (usually on weekends, because ain’t no one trying to chop onions at 8 am on a weekday morning). If you can’t find english muffins, you could also make these with regular bread, hamburger buns or some hawaiian rolls (my fave!!). 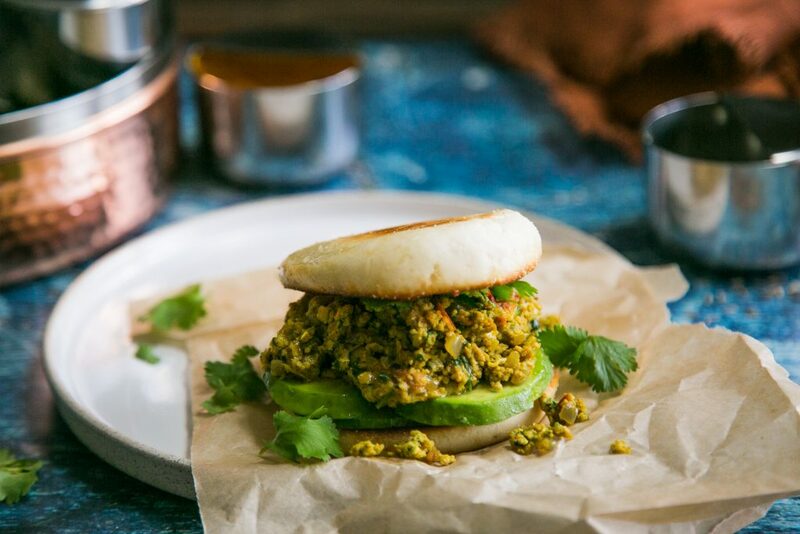 Just make sure you toast them up nicely because the bhurji will be a little juicy and you don’t want a goopy mess of a sandwich in your hands! 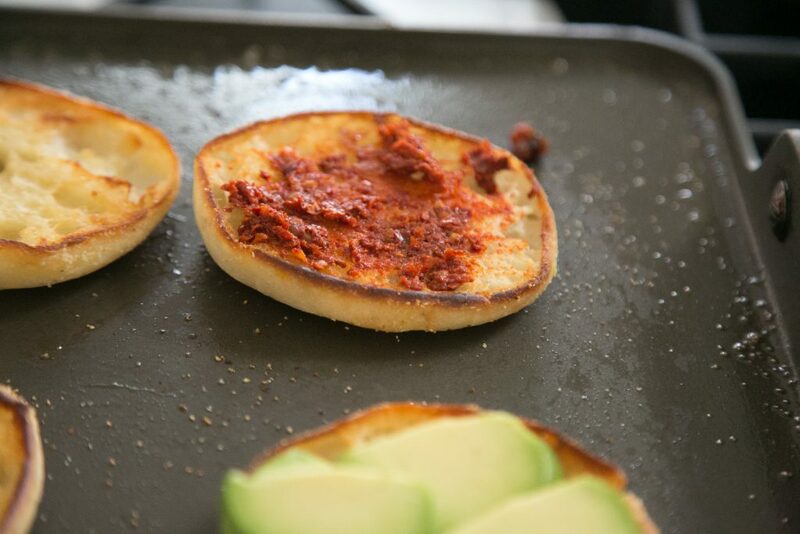 English muffins toast up really well so it’s perfect for this! The spicy avocado mash isn’t anything fancy but its now the only way I can eat avocado and its QUICK. I use Prakash thecha chutney packets which can be found at your local Indian grocer or if you have a family member who makes this fresh at home, get them to give you some! Now if you REALLY want to treat yourself, use my avocado serrano chutney as a spread for this sandwich!! 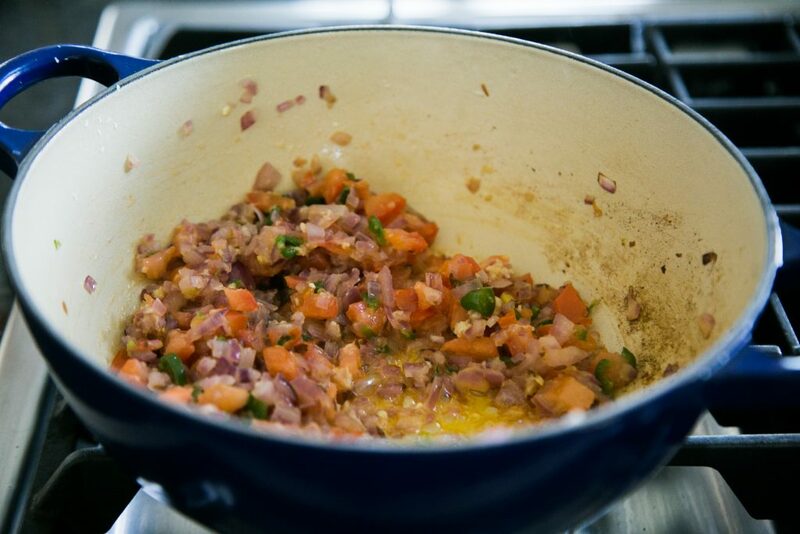 In a large skillet or wide bottom pot, heat oil over medium high heat. Once the oil is hot, add the cumin seeds and diced serrano pepper. Once the seeds splutter, add in the onions. Cook onions, stirring continuously, until lightly golden and translucent (about 8-10 minutes). Once the onions have cooked down, add the ginger and garlic. 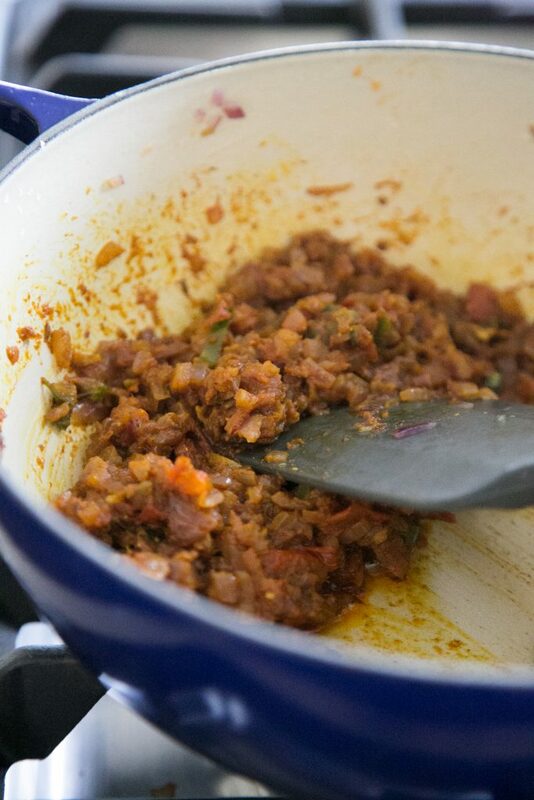 Stir for a few minutes until fragrant .Add tomatoes, turmeric, chili powder, coriander/cumin powder, 1 tsp of the garam masala, salt & pepper. Cook this mixture on medium heat until it forms a thick gravy/paste like consistency ( you can use a potato masher to help it get to this gravy like texture). Add in 5 whisked eggs to the pan, turn heat to low and slowly cook the eggs, stirring continuously for about 10 minutes. 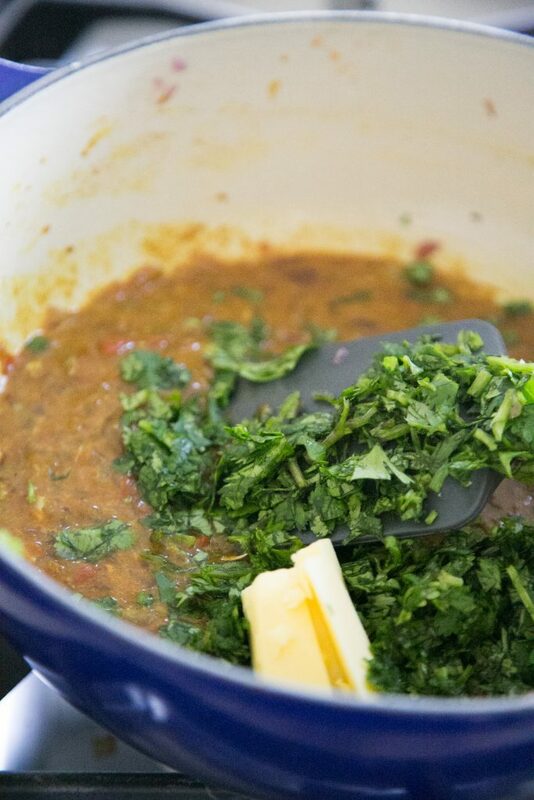 Once the eggs look half way cooked, add in the cilantro, remaining 1 tsp of garam masala and butter. Continue to stir and cook until eggs are cooked but not completely crumbly in texture (they should still be a little wet- and don't forget to check for salt at the end). 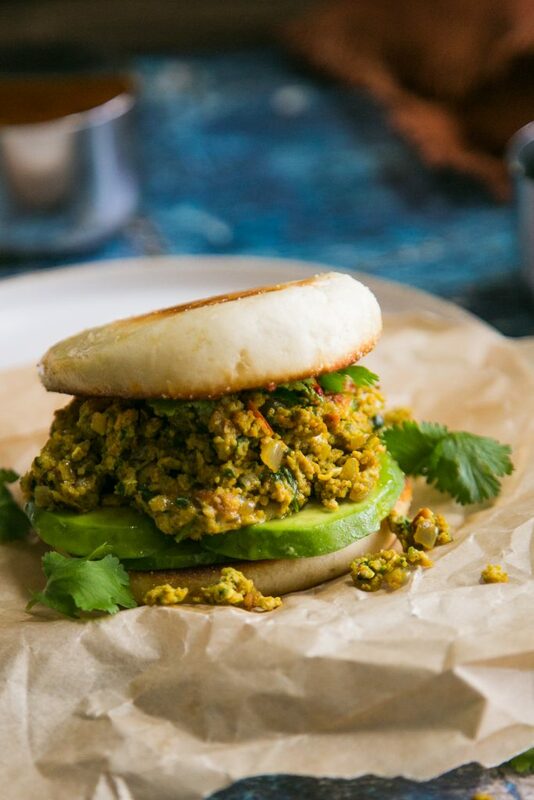 Assemble sandwiches by toasting each english muffin half and spreading each side with avocado mashed with thecha chutney (this is spicy so add just a tiny amount). 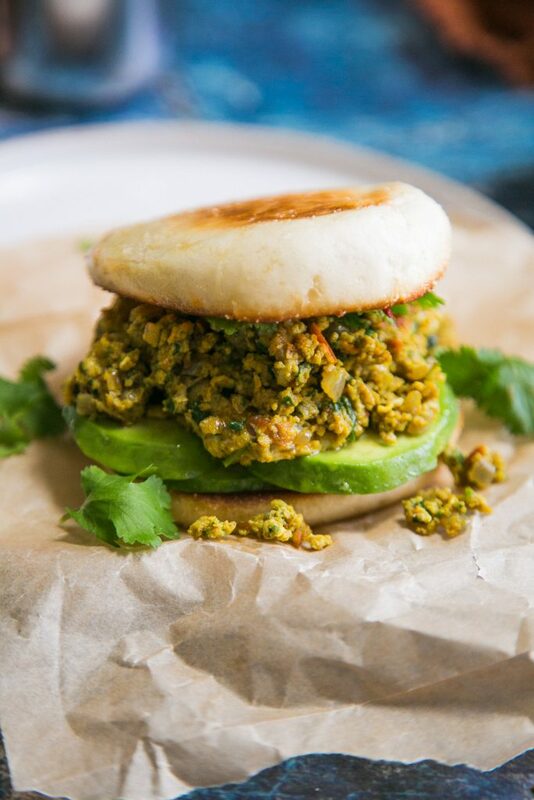 Top with egg bhurji, a slice of cheese if you like, and some more chopped cilantro. Serve hot.